We awoke to a beautiful day with high cloud and wind. Unfortunately we also awoke to the sound of sms messages coming through at an alarming rate. Brisbane is being savaged by rain and floods which are only getting worse. Rona called home and although her house is safe there is no transport in the area. She was due to get off at Hamilton Island tomorrow and fly back to Brisbane for some important meetings on Friday but calls to her clients confirmed that no one can move at the moment so the meetings are postponed a week. Good news for Dreamagic because she can stay on the boat, but worrying for anyone with Brisbane connections. 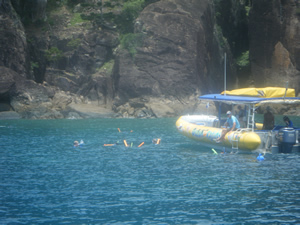 We decided to sail to the north of Hook Island where the diving is supposed to be the best in the Whitsundays. 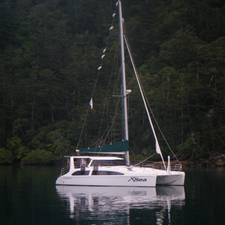 W grabbed a public mooring in Luncheon Bay and our guests spent a couple of hours snorkelling before we moved on to Manta Ray Bay which is said to be the best. We were lucky enough to catch a mooring here also and we all dived along with the contents of a couple of tour operator craft and saw the coral here. The tour boats are regulars and a couple of giant groupers hang at the site waiting to be fed which livens up proceedings when you first encounter them. About lunchtime we slipped the mooring and sailed down the Whitsunday passage in sometimes 20 knts of breeze to a delightful anchorage called Sawmill Bay in the lee of the Whitsunday Island at Cid Harbour. Dinner was a very French affair of pork medallions coated in a parmesan batter and served with grated potato cakes, French beans (what else?) and pumpkin. Thank you Isabelle. A fitting end to a superb day.